A shared homemade meal is a fine way to offer gratitude for friends and family and participating in the actual act of cooking the meal together makes it even more special. 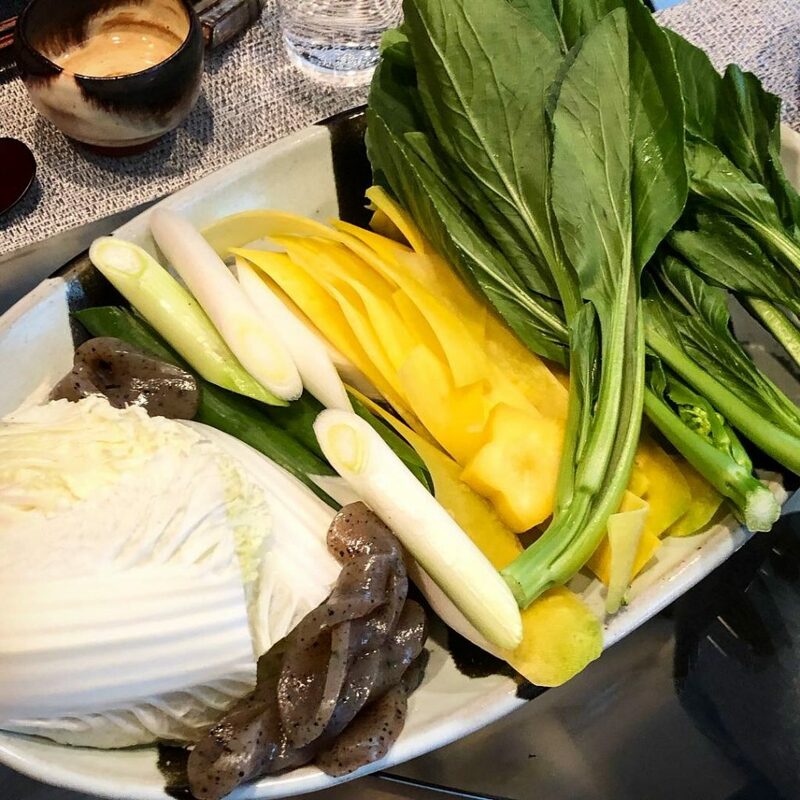 Shabu shabu (swish-swish) is the Japanese onomatopoeic equivalent for the name of a popular nabemono, a simple and delectable Japanese hot pot dish. It is a meal of near-paper-thin sliced meats (typically beef and pork), vegetables, and usually udon noodles for the finish. The history of shabu shabu in Japan is relatively recent, with roots in a hot pot dish from Inner Mongolia known as Xiao Wei Yang. Restaurant Eiraku-cho Suehiro Honten in Osaka is widely known as the originator of shabu shabu, though the dish was first adapted at Kyoto restaurant Junidanya in the early 20th century. In our house this year, we chose to serve shabu shabu as our annual Christmas meal with friends. 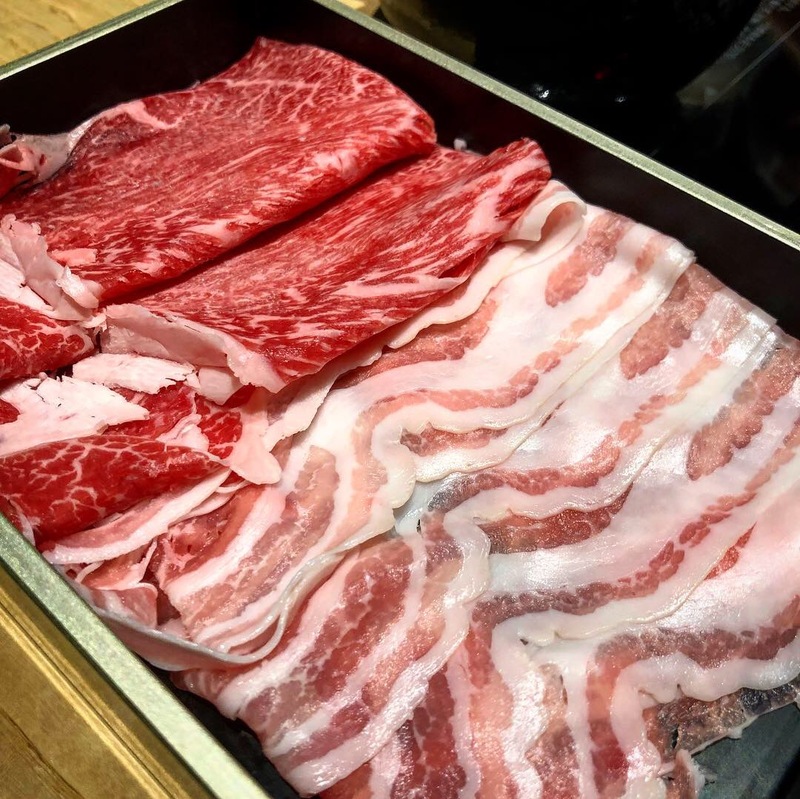 The holidays have the potential to be chaotic, and the simplicity of shabu shabu, from preparation to table-side cooking, is one way to minimize stress. Everyone cooks their own ingredients to desired doneness. A friend who is chef/owner of a local Portland Japanese restaurant procured sliced A5 wagyu beef ribeye from Japan for us. The pork was from a local, Pacific Northwest pork producer that finishes its pork on Oregon hazelnuts. Vegetables included napa cabbage, wide strips of carrot, shiitake and eryngi mushrooms, tazuna konnyaku twists, Chinese choy sum greens, and sanuki udon for the shime finishing course. The traditional broth is a simple dashi made from kombu seaweed. Each couple added items to the pot from their own separate serving platter with large chopsticks. We started by adding a few vegetables to the simmering broth, then next a slice of meat for each person, cooked to desired doneness. Two dipping sauces – both ponzu and roasted sesame seed – were paired with the cooked ingredients depending on each diner’s taste. While the roasted sesame seed is often paired with the beef, ponzu with its acidic kick is a personal preference to offset the richness of the well-marbled beef. 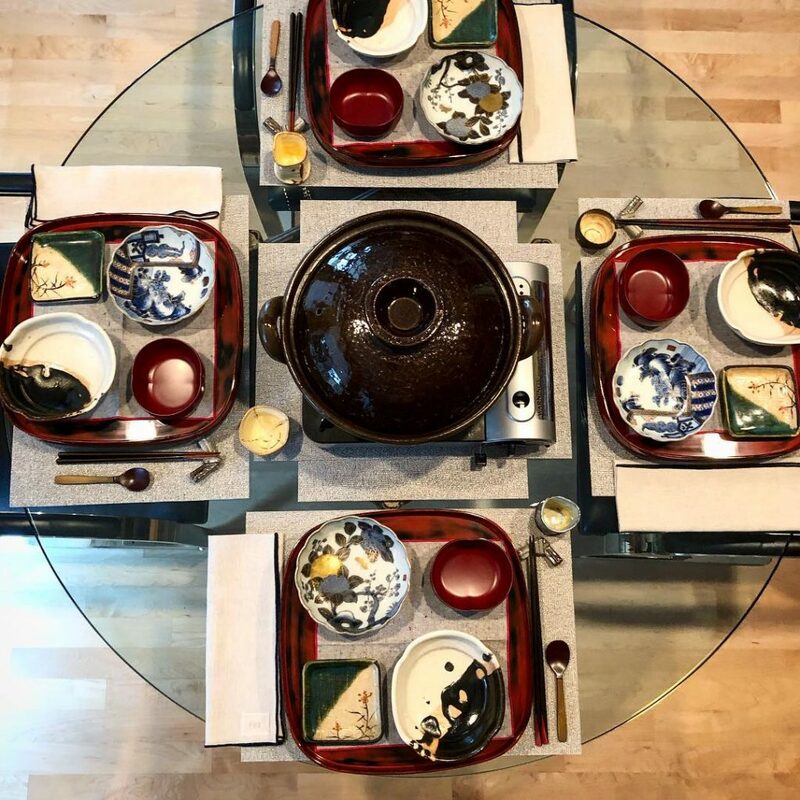 As the shabu shabu meal progresses, and the broth becomes enriched with the flavors of the meat and vegetables, so too does an evening spent with good friends become enriched with shared memories. A compatible sake only brightened the meal and evening that much more. 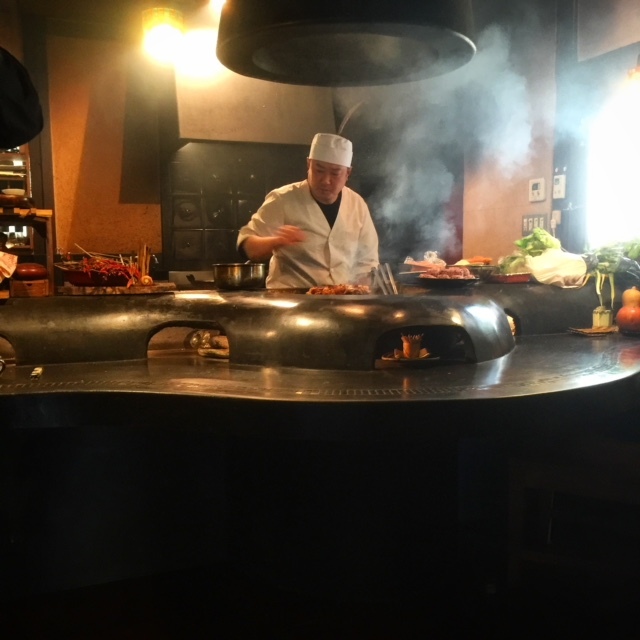 We had shared a beef and pork shabu shabu lunch at Kyoto’s Hyoto Kyoto restaurant with our Christmas guests back in November 2018. The downtown location is lovely, with an understated, modern interior that is open yet semi-private with the floor-to-ceiling chain mail screens separating tables. 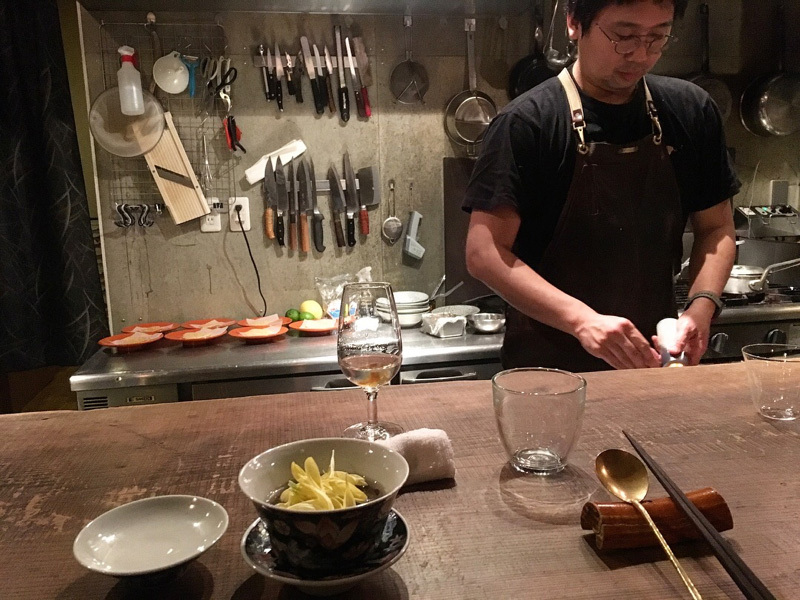 Hyoto Kyoto has elevated shabu shabu by providing kami nabe in which to cook your meal. Instead of an earthenware or metal nabe pot, a special paper insert is placed inside an open-weave bamboo basket that sits atop an induction cooktop that is flush with the table top. A perforated, stainless steel disk weights down the paper insert before the kombu dashi is added. It was an unexpected presentation that captivated us all; a quiet elegance that perfectly matched the restaurant. That lunch was the inspiration for our Christmas dinner. 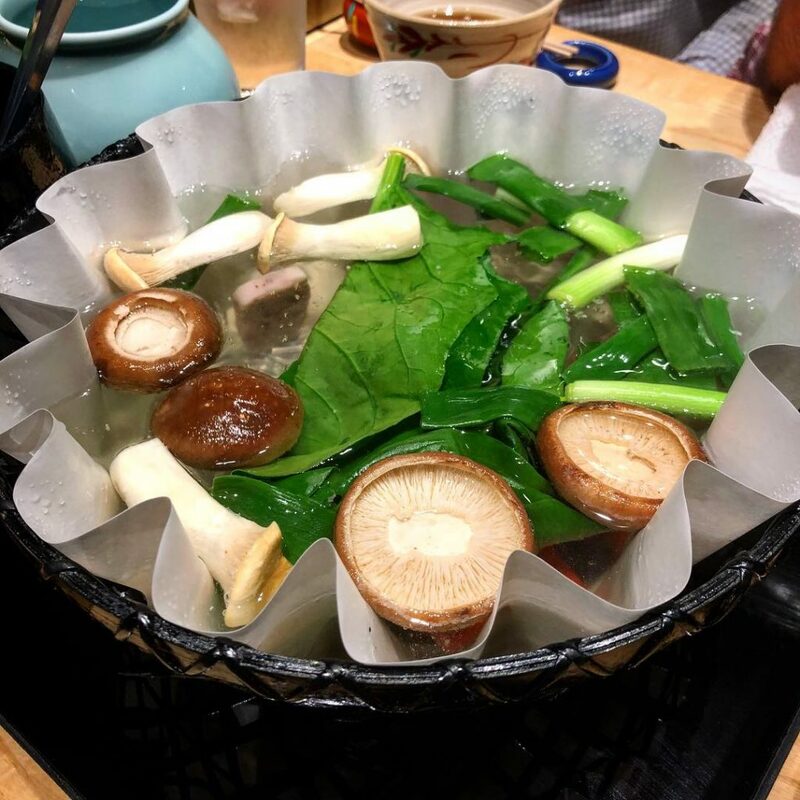 Recipes for nabe-like dishes such as shabu shabu are easily found online, and can be tailored to whatever one desires to eat that is seasonal and fresh. Thinly sliced fish and other seafood is a good option in lieu of meat, as is tofu; the resulting broth is also delicious. A variety of vegetables is a must. And for those who adore texture, including konnyaku (in the form of slices, twists, or shirataki noodles), or harasume (mung bean starch) noodles, is a welcome addition.